I watched yesterday’s City Council meeting regarding the Police Bureau PS3 program and am writing to correct the record on statements made about the Portland Police Association. Like any union, we work diligently to ensure that the wages, hours, and working conditions for our members are the best they can be. We do so within the boundaries established by Oregon collective bargaining law. Those boundaries are equally applicable to the City. The comments by City officials and Commissioners included references to me and the PPA delaying the process of negotiating the PS3 program. That is untrue. The current PPA contract took effect November 11, 2016. The PPA committed to negotiating the PS3 (then CSO) program with the City as part of that new contract. In early 2017, the City began the process of funding the PS3 program through the budget process. On May 2, 2017, I wrote a reminder letter to City Council about the need to collectively bargain with the PPA over the PS3 program. I received no response to my letter. On June 21, 2017 and September 13, 2017, we met with City officials to discuss possible job duties for PS3s. We provided detailed comments to those officials about the job duties. We didn’t hear from the City again on the topic until early 2018. When we finally did hear back from the City, we promptly communicated with the City on February 21, 2018 about the need to collectively bargain over the PS3 program. We met and bargained with the City on numerous occasions in Spring 2018 about the job duties for PS3s. By mid-June 2018, City Council passed an ordinance that included job duties that we negotiated with the City. Thereafter, we bargained in good faith with the City over the remaining terms and conditions of employment for PS3s, including bargaining meetings on July 23, 2018, August 9, 2018, August 15, 2018, September 6, 2018, September 17, 2018, September 24, 2018, and October 2, 2018. We reached a tentative agreement with the City on the PS3 program on October 2, 2018. We immediately presented the tentative agreement to our members for a vote. Over 94% of the voting members ratified the deal on November 9, 2018. After confusion on the City’s own part, the City informed us that it, too, would need to ratify the deal with a City Council vote. The program was presented to you yesterday for ratification by City officials on a schedule that the City alone determined. We have maintained detailed notes of our meetings, along with copies of all the bargaining proposals, most of which we drafted and presented to the City. Accusations by City officials, seconded by City Council members, that the PPA engaged in delay tactics are simply false. A new, comprehensive Police Bureau program takes time to develop and implement. We diligently held up our end of the bargain in negotiating the new PS3 program. If City officials are looking for an explanation for the delays, perhaps a long look in the mirror is in order. In addition, some discussion centered around an alleged comment I made about the duties of PS3s, to include a comment ascribed to me that I believed that PS3s would only be working the front desk at police precincts. I have said much about the PS3 program and the job duties expected of this new position. Just yesterday, I appeared on a radio show to discuss the clear delineation between sworn police officers and non-sworn PS3s, including the differences in their respective job duties. Understand that the vast majority of the public want a police officer to show up when life, limb, or property is in danger. Also understand that there’s a need, albeit a narrow need, for someone other than a sworn police officer to respond to certain community calls for service, such as a non-injury car crash where someone needs to wait for a tow truck, transporting found property without an identifiable owner to the property room, and the like. That’s where PS3s come in. At times, I have referred to PS3s being able to take non-emergency reports at the front desks at precincts. At no time have I advocated for PS3s to only work the front desk of police precincts. I am fully aware of the scope of their job duties; I negotiated the class specification with the City. But City officials and many Commissioners perpetuated half-truths and hearsay about my descriptions of the PS3 job duties during the City Council meeting yesterday. I will take this opportunity to reiterate what I have repeatedly expressed to this City Council and other city councils: if you want to know my thoughts on a topic, if you want clarification about the PPA’s position, pick up the phone and discuss the matter with me. Finally, I was surprised to hear a common thread in many of the comments from some of the Commissioners; an anti-union sentiment. For example, questions were asked and comments were made about whether some other union should have represented the PS3s. Let me remind you that the PPA is a labor union. We represent working people. We advocate for their labor rights. When you criticize the PPA and make misleading comments about our fine organization, you are casting baseless attacks at over 880 working class families whose husbands and wives dedicate their professional careers to keeping this City safe. If you sense frustration in the tone of this letter, it’s because I am frustrated. I am frustrated that this City Council has lost its focus. I’m frustrated at the lack of results for our community. 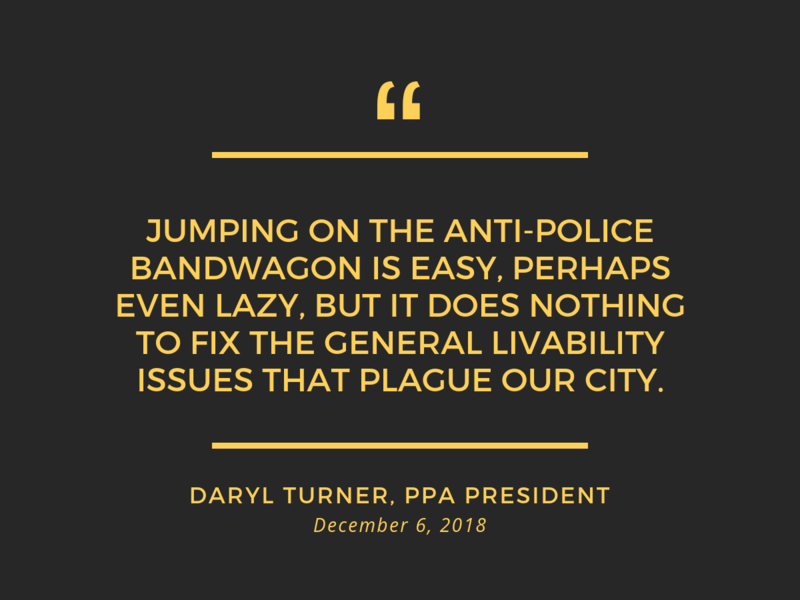 Jumping on the anti-police bandwagon is easy, perhaps even lazy, but it does nothing to fix the general livability issues that plague our City. The PPA and its members will continue to prioritize public safety in this City. We will continue to constructively discuss solutions to the lack of everyday livability in our City for each of our community members. Don’t lose track of your focus and priorities. Rather than taking cheap shots at a union, please work to make this City better.